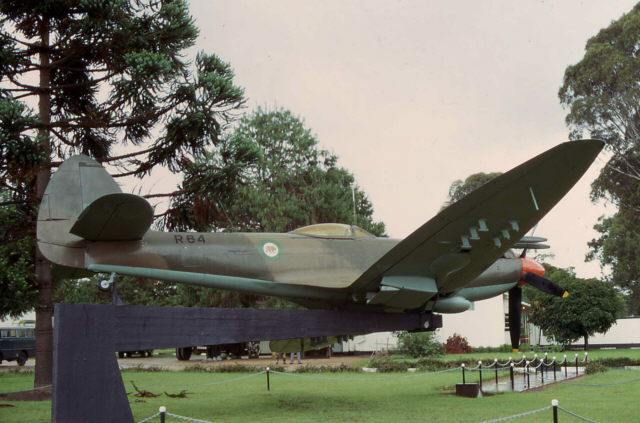 The re-established South Rhodesian Air Force received a complement of 22 Spitfire Mk 22 fighters. These were delivered from the UK between March and December 1951, and two new Squadrons (No.1 & No. 2) were formed to operate these aircraft. The Spitfire served in first-line duties for only three years, being superseded by de Havilland Vampires FB.9 in early 1954. In 1955 ten Spitfires were sold to Syria and the remaining aircraft withdrawn. The SRAF was re-established in 1947 and two years later, Southern Rhodesian Prime Minister Godfrey Huggins appointed a 32-year-old South African-born Rhodesian Spitfire pilot, Ted Jacklin, as air officer commanding tasked to build an air force in the expectation that British African territories would begin moving towards independence, and air power would be vital for land-locked Southern Rhodesia. The threadbare SRAF bought, borrowed or salvaged a collection of vintage aircraft, including six Tiger Moths, six Harvard trainers, an Anson freighter and a handful of De Havilland Rapide transport aircraft, before purchasing a squadron of 22 Mk22 war surplus Spitfires from the RAF which were then flown to Southern Rhodesia. The South Rhodesian Air Force was first established in September 1939 as a transition of a humble Southern Rhodesia Air Unit trained in the UK during the 1930s, which also became the No. 1 Squadron. The SRAF lasted as independent organisation for only about six months. The war in Europe was developing rapidly and unfavourably for the British prompting rapid mobilisation of overseas resources for the war effort. In April 1940, SRAF was therefore absorbed into the Royal Air Force and No.1 Sqn redesignated 237 (Rhodesia) Squadron RAF. Soon, the Rhodesian Air Training Group (RATG) was initiated as part of the Empire Training Scheme. During the course of the war, RATG expanded to of four Service Flying Training Schools, an Initial Training Wing, a combined Air Observers and Air Gunners School and a Central Flying School for instructors. Over 7600 pilots and 2300 navigators were trained in Rhodesia during the war years. Later in the WWII two more RAF units received the name “Rhodesian”: No. 266 Sqn and No. 44 Sqn. Immediately after the end of hostilities in Europe and the Far East the training establishments were rapidly reduced too much smaller capacity, but training of RAF crews in Rhodesia would eventually continue until 1954. In the meantime, SRAF made its second debut as an independent air force. Re-created in 1947, it consisted initially of but one Communications Flight operating a miscellany of well-worn trainers and transports left over from the RATG. It was not until 1951 that the force received its first combat aircraft, the Supermarine Spitfires Mk. 22. These fighters equipped No 1 & 2 Squadrons in a newly-established air base in New Sarum. In September 1953, SRAF was renamed Rhodesian Air Force upon creation of Federation of Rhodesia and Nyasaland. A year later, in October 1954, by appointment of the Queen the prefix ‘Royal’ was added to the name, thereby becoming the Royal Rhodesian Air Force (RRAF). The 1960s saw the breakup of the Federation, followed by the start of the insurgent war which would eventually last until the late 1970s. On 1 March 1970 Rhodesia declared itself a republic, and the ‘Royal’ prefix was dropped from the title of the RRAF, which became the Rhodesian Air Force (RhAF).